Every time I review a book from the 1980’s, I get Hobgoblins stuck in my head. Not the Roger Stern Amazing Spider-Man story arc from issue #~250 or so, but an episode of Mystery Science Theater called Hobgoblins. And to this day, whenever I think of the 1980’s, that’s where my mind goes. So just know that as I write this review, I’ll be playing that on repeat in my brain. This is, if nothing else, a book of moments. Most bad, but at least one good. And I will get to them, because I have an extremely hard time separating this title from the defining moments within. But let’s start off with the plot. When a catatonic Metron is found by Darkseid, the lord of Apokolips and the Highfather of New Genesis come together to find the cause of his malady. This leads to their assembling a team of heroes to fight back against the foe responsible: the living embodiment of the Anti-Life Equation. Four aspects of the Anti-Life Equation’s main self have split off and broken free of their prison by following Metron back to our realm, and with each primed to set off a planet-wide bomb capable of damaging the Milky Way enough to let the ALE sneak through, the heroes are split up to find and stop the bombs. In the meantime, Darkseid, Highfather, and a reluctant Jason Blood are left to deal with the ALE itself. The four groups of heroes all have their own little mini-boss battles with only one team failing to stop an explosion. In the biggest twist that everyone everywhere ever saw coming, Darkseid is hoping to steal the ALE’s power for himself, but he is stopped by Dr. Fate when Batman had the foresight to call him along to watch Darkseid. That’s pretty much it. It’s a decent little story, if entirely unremarkable. So the first of the moments—if not the worst—is early in the book when Batman is fighting an alien from Apokolips that has become stranded in Gotham City. As Batman finds the foe to be exceptionally powerful, he uses all of his cunning and strategy and skill to… shoot a big hole through him with a gun. It’s the least in-character thing I’ve ever seen Batman do. And it’s “rationalized” by Bats’ thought dialogue of (and I’m barely paraphrasing here) “I hate guns. But oh well, I can adapt”. He’s not even broken up over it; it’s just as if this alien is the most difficult nemesis he has ever faced, so he chucks his entire life code out the window for an easy out. You might as well have Batman say “If there’s one thing I know about criminals, it’s that they are brave and rooted in logical thought”. But, like I said, Batman doesn’t even let what he does get to him. Another character in the book, however, lets something get to him far too much. John Stewart and Martian Manhunter are teamed up to stop one of the bombs, you see, and they are the only team to fail. When Stewart finds himself feeling slowed down by the Manhunter, he sends him away so the Green Lantern can save the day on time. You know what they say about pride, though, and the ALE aspect has outwitted the Lantern with a yellow bomb. The planet Xanshi is destroyed, and John is rightfully devastated by his failure. As he should be. But where the story goes too far is in having John try to kill himself shortly there after. Look, I get it. I can’t even fathom the emotional toll of being responsible for the death of an entire world. But you know what I’m not? A living paragon of willpower. Under no circumstances should any relevant GL consider suicide. It’s just so adverse to everything being a GL stands for. And even how it is told in the story is so damn heavy-handed and pitiful. He sits there gun against his head and crying, contemplating his fate. Until J’onn comes out of the shadows with some equally uncharacteristic tough love, telling Stewart essentially “Yeah, you should just do it. Do it, coward”. This snaps the Lantern out of it, but damn… John just deserves better. 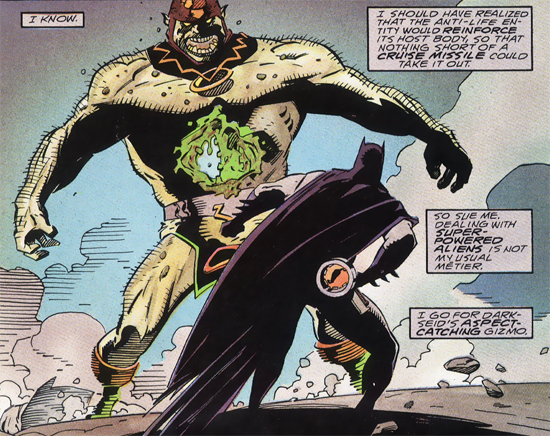 I’ll counter my bitching of those two scenes by bringing up a moment I appreciated: Batman is sent to stop the bomb that has been planted on Earth with a New Genesis hero named Forager. Batman finds himself out of his league against the aspect, and Forager saves the day… at the risk of his own life. Later, when Batman is telling the others about Forager’s heroics, Orion (who is weirdly super racist against whatever kind of being Forager was early in the story) remarks “Who would have thought the bug had it in him”. To this, Batman reacts violently, slapping Orion and screaming “His name was Forager!”. It’s uncharacteristic of Batman to react so powerfully, but I’ll accept this bit of behavior because it’s so meaningful coming from Batman. 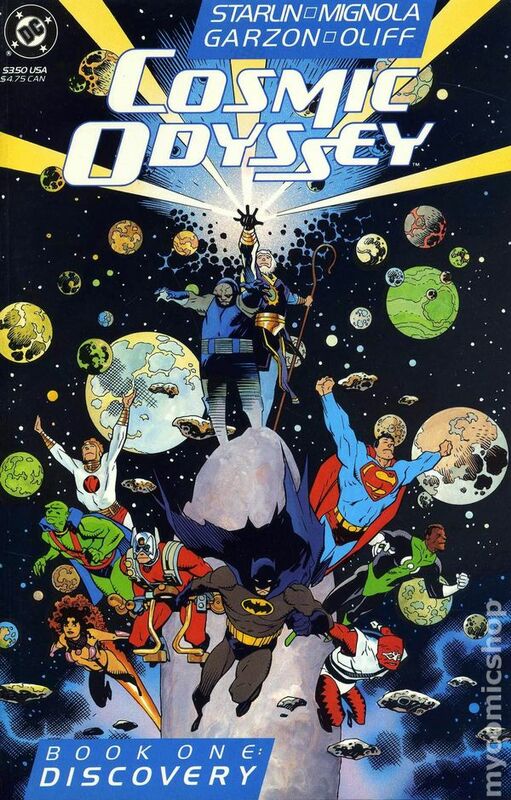 Also, Cosmic Odyssey was published concurrently with Death In The Family. I’m not sure which was supposed to take place before the other, but assuming DitF happened chronologically shortly before Odyssey… his reaction makes even more sense. Last note here is that Mike Mignola handles the art on this book, and that is ALWAYS a plus. Cosmic superhero fight epics are not what I picture when I think of Mignola, but it’s always a joy to get more from him. Talking Point: The Green Lantern and Batman stuff in this book got me thinking: what other books have you read where a character acted so strongly in the face of their own established identity. Did you like that, or did it shock you out of the story? It’s a fun enough story, honestly. Those moments I mentioned above (and a few other things, like the tropes-y way Dr Fate is hidden until revealed) really detracted from the tale for me, but if you can somehow remove those from the rest of the book, it’s not bad. But for me, those scenes pretty much ARE the book.